As a self-confessed Instagram addict, I basically bought my iPhone just to have the opportunity to post a million pictures of my meals. Talk about dedication. But soon, thanks to Sabo Skirt, the Australian-based fashion company, I found such amazing accounts from Australian beauties who inspire me regularly with their beauty, fashion, health and fitness. Check out the accounts below and get ready to hit follow. Steph’s account is hands-down my favourite to follow. She’s a 20-year-old Australian model who, is not only drop dead gorgeous, but she gives you an inside look into her beauty, health and fitness regimes. With 285,000 followers so far, she’s definitely one to keep your eye on. Gabby is a total blonde bombshell whose bikini posts will make you want to step up your fitness game, stat. Along with being a beauty inspiration, she posts pictures from her photoshoots and her adorable puppy, Hunter. 16-year-old Lydia is my top prediction for one day becoming a Victoria Secret model. She is just such a natural beauty—most of her pictures are of her sans makeup and she’s still gorgeous. Her posts are mainly selfies, but she also shares dancing pictures and photographs showing her spiritual side. She’s definitely one to follow as her career is only going to get better and better. Emma is the sister of Caitlyn Paterson, a model for Sabo Skirt. Her account is mainly of her fitness journey, which includes delicious and healthy recipes, fitness posts and smoothie combinations that will provide you with tons of daily inspiration. Brooklyn is all for the raw lifestyle. Her account is so colourful, thanks to all of her healthy, raw food posts. 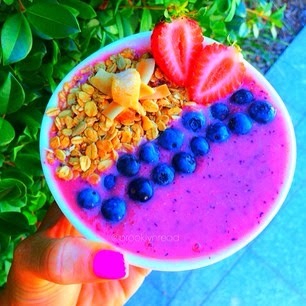 These include smoothies, smoothie bowls, healthy food hauls and fruit combinations.